I was going to start posting a series on alternative corridor generation for random dungeon creation, but then I was reminded about a recent forum discussion on the caller. There's not a lot of information about what a "caller" is in the original three booklets. Callers are mentioned in a play example on pages 12-14 of Underworld & Wilderness Adventures. The book doesn't say what a caller does, but in the example it's things like "We're going downstairs," "Three of us listen at the door," "Two of us throw our weight against the door while the others get ready for combat." Based on that example, some people have come to the conclusion that OD&D is a bad RPG because it deprotagonizes players. The caller decides what everyone does, and the other players just have to shut up and do as they are told. Why on earth would an RPG do something like that? Why would players roll up characters, give them a name, and buy equipment if they weren't actually going to do anything from then on? Why wouldn't OD&D instead be a one-on-one game where one player controls an entire party? Some people have thought of that line of logic and thus ask for clarification on what a caller is, or why the rule exists. But the short answer is: it's not a rule. It's just a convenience. Somebody tells the referee what everyone is doing. It doesn't mean there is no discussion among the players, or that a player can't disagree with what someone else says they should do. The example in U&WA skips over what other people are saying, because it's supposed to be an example of how the referee moderates what's going on. Players aren't supposed to worry about that section at all. 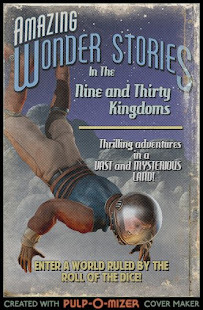 The Fantasy Trip was published only a few years after D&D. It's not D&D, but it has some D&D features, including a tradition of using a caller. Perhaps D&D should have had something more explicit, such as this passage from In the Labyrinth, the TFT campaign guidebook. This makes it sound more like a rule, but even here, it's aimed more at the referee than at players. What do referees do when players don't designate a caller or leader? They should treat the party as being a little noisier. That's it. There's no other rules in that paragraph. Even this glosses over the fact that there are different levels of caller/leader. Some groups might just have someone make decisions on which direction to go and nothing else. Others might have the leader assign tasks to each character, although the player of that character decides how to obey, if they obey at all. In practice, I don't think I've ever seen any GM ask who would be the caller, nor have I seen players make a formal decision on who would be the caller. It was always informal. The GM would ask, "What are you going to do?" and someone would reply, "We go left." If no one said otherwise, that person was the caller. The only hard rule I'd use is: what players say to each other happens in the game world, while what players say to the GM is happening in the real world. That means that if people are arguing over which way to go, their characters are arguing, too, and therefore monsters can hear them. This means extra wandering monster rolls. Things like a caller saying "We go left," or a player asking "Do I understand what the goblin is saying?" do not happen in the game world, so monsters can't overhear them. They basically happen outside of time. I recall a DM trying to use a caller years ago, it didnkt work for long. What does work now and again is a mission or task leader. One player acts as the ledaer and makes the decissions for the party and the other players mostly go along but are not actually restricted to those actions. It works to focus a raid, or scout mission. It only seems to work for half a session or so at most. I'm betting the key to why it didn't work is the fact that the DM was trying to use a caller. Callers aren't something the DM uses. Callers are just a role that a player can take on to make their expedition more successful. Like "chronicler", the guy who takes notes on everything the party did or found. What the DM does is respond to the use or absence of a caller in particular ways. As I said, if the players don't use a caller, the DM should assume that the party is having discussions in the underground hallways about where to go next, at whatever volume the players are having that discussion. And I think callers are used far more often than people believe. I think informal callers happen naturally. Especially if there's mapping going on. If a group is taking a more informal approach to mapping and not making the dungeon itself a puzzle for players to solve, then callers are useless and would bog down play. 1) in a loud environment like a convention he can help "whip" the other players and make sure game turns keep moving at a good pace. 2) in a more formal game, the several players discuss actions. Only when the caller tells the DM what they do are their actions "locked in"... no arguing after the caller calls what's happening. 3) in combat, in a game with initiative by sides and a large number of PCs, the caller may be in charge of keeping track of declared actions. This is sort of like #1. While I could see a caller for a large table it seems like added procedural clutter in most situations. But remember Dave and Gary had big tables sometimes, like ten guys at once. And a lot of those guys didn't get rule books, let alone know any rules. So having a more experience player help them along by whipping and wrangling might have seemed perfectly normal.